This is what I miss: making a spur of the moment decision to go somewhere. Two of the raffle winners for the Hot Air Balloon Fiesta weren’t able to claim their prize. When my friend Hazel saw it, she said we should go. Lying down on the grass and watching balloons soar into the air. Can’t do that when you’re working. I quickly sent a text to Rey and Heinji and got positive responses: we’re going to Clark, and we’re leaving at 3am. It was already 8pm. That’s what I love about impromptu plans: it leaves you no time to make up excuses to flake. With barely 2 hours pf sleep (some none at all), we drove out of Manila and arrived in Pampanga while it’s still dark out. Being at the event as one of the invited media is very different from being there as a regular attendee. Though I certainly missed breezing through the gates and having a pass to get to wander around with the balloon crews, it was also quite enjoyable to just lie down on the grass and listen to the announcer explain how hot air balloons fly — something you don’t get to do when your mind is preoccuppied with taking pictures and noting every detail. It was also great to be out with friends again. Hazel, Rey and Heinji are three of my oldest friends and it’s been a while since we’ve all hanged out, much less go on a road trip together. We actually made the same trip 8 years ago, when I was on assignment for the travel magazine I used to work for. It was the year the balloons didn’t come and we were way behind our scheduled departure time. It was good to know that while things change, whether for the better or worse, you can still count on your friends for a great weekend. 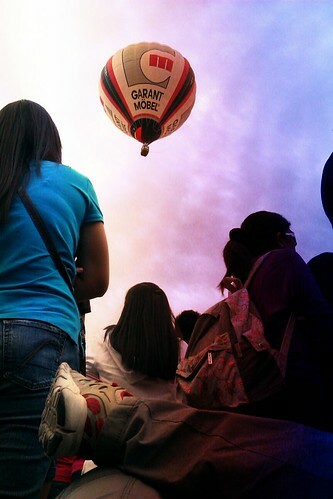 We missed to witness the flying balloons on Sunday coz we arrived late. It was our first time so next year we will make sure to stay na lang near the venue overnight. Awww sayang! Puede naman kahit di mag overnight (I heard fully booked daw lahat ng hotels in Clark), but you have to leave really early talaga.